Motorola recently released two devices in the Indian market, the Moto X and the Moto G. In this article I'm going to show your a step by step noob friendly guide on how to successfully root the Moto G.
Disclaimer: Rooting and unlocking the bootloader of this device will void its warranty and you would not be able to claim the same from Motorola. Please do it at your own risk. Rooting the Moto G is an extremely easy step if you've already unlocked its bootloader. Once the bootloader is unlocked, all one needs to do is flash the superboot file, a download link to which is available in this tutorial. Here's an easy to follow YouTube tutorial on "How to Root the Moto G"
Step1: Download and Unzip the superboot zip file (link below), preferably onto the C drive. Step2: Head onto the folder where the zipped files are located. Step3: Hold the 'Shift key' on your keyboard and 'Right click' on an empty area in the folder. 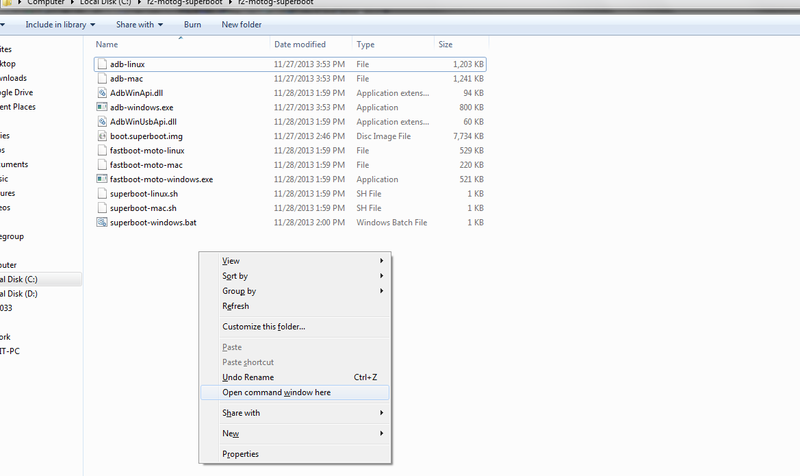 Step4: Select the option 'Open Command Window here", this will open a black command window on the PC. Step5: Power Off your Moto G and bring it onto the bootloader mode by pressing the 'Power' button and the 'Volume Down' button for 2-3 seconds and releasing it. Step6: Connect the phone to the PC using a usb cable. Step7: On the PC, drag the 'root-windows.bat' or the 'superboot-windows.bat' file onto the black command window and hit Enter. Thats it, your Moto G would now reboot and would now have SuperSU installed onto it. This will give you root access on your device. Please note, the above method will only root your Moto G and will give you root access. You would not be able to install a custom rom just yet. To be able to install a custom rom onto it, you would need to install a custom recovery software on the phone. Subscribe and stay tuned to this blog for an easy to follow tutorial on "How to install a custom recovery" on the Motorola Moto G.
I hope this article was useful to you. Please let me know in the comments section below if you have any questions and I will try my best to answer them as soon as possible. Please feel free to connect to me via the social media circles mentioned below for regular updates on my blog. Photography lovers: How to unlock & enable additional camera options on your Moto G.